When you installed the Windows Phone 8.1 SDK and try to create and run the first Windows Phone application . You will be prompted to get a free developer license which is necessary to develop and test the windows phone store app on the Windows 8.1 PC before publishing and getting it certified in the store . – When you run Visual Studio 2013 (with Update 2) for the first time , you will be prompted to obtain a developer license . – You will be shown the User Account Control (UAC) dialog box . Click Yes to proceed. – Enter the Your Live account login credentials and login . 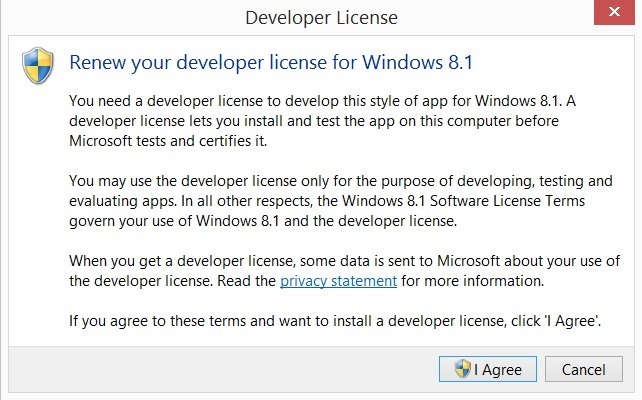 You now have a developer license and you can develop apps for Windows 8.1 until it expires. You’ll need to renew your license before it expires to continue developing apps. Learn more.